Everybody loves trivia. And once you add drinks and dozens of patrons, you're in for some good times. 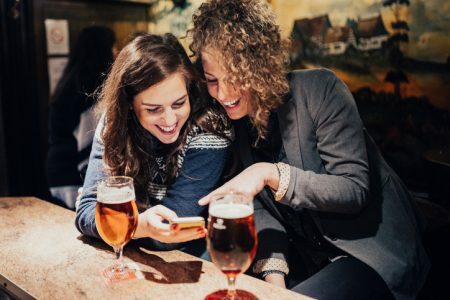 People love to compete, and with game trivia you can also cash in as people spend more money at your bar. If you’ve thought about doing game trivia at your location, there’s a ton of reasons why you need to make it happen now. Here's how game trivia makes for an awesome bar. One of the coolest things about hosting trivia nights at your bar is that people will come from miles around just to be a part of it. Not only do people love competing, they also love the prizes and cash that come along with winning. While the trivia team members give their best answers, the bar crowd will also get a kick out of making fun of stupid-funny wrong answers and cheering on the people in the game. Having game trivia can also mean the difference between the majority of patrons staying for one round of drinks versus staying for the duration. What better way to put useless knowledge to good use than to use it to bring people in the door on a slow Tuesday night? While most bartenders chalk up slow tips on weekdays to just a fact of bartender life, a well-planned game of trivia will get people in the door on the off days. Here’s a pro tip: You can even hire an MC to shame people into staying longer by announcing bar specials during the game. Under normal circumstances, strangers at the bar don't really have a reason to talk to each other. But suddenly when you add trivia to the mix, all bets are off. When game trivia night is on, suddenly you'll see a lot more people chatting it up about their favorite episodes of Game of Thrones. With BOTY app, people can use their phones to participate in the trivia game rather than being bored and on Facebook. Make BOTY app and game trivia night at your bar the reason why Jane and Jim met and went on their first date! So fancy cocktails or famous celebrities are simply out of the question for the crowd your bar usually attracts (or the bar owner’s budget). Don't give up! Your bar can still become known for something! Instead, turn your bar into the only one in town that has a themed trivia night. As people show up to participate each week, you'll create your own versions of local celebrities. Treat them like rockstars and encourage teams to create their own unique team gear to generate the excitement.